The GatePass Badge Builder enables creating cards in seconds, since it is easy to set up and operate by drag & drop actions. Each tag/card can contain database features: background color or image, images, photo ID, text fields, etc. Photo ID can be captured by a digital camera or imported images. GatePass contains powerful database search tools for all fields and it is network-oriented to the Access Control Server. 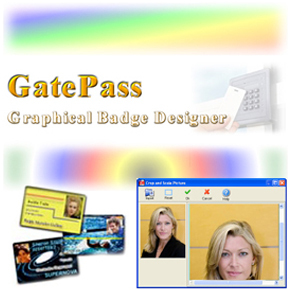 GatePass is a windows-based software that allows editing and printing tags for Access Control. The user can select a specific background, add a photo ID as well as text and print it out to a tag printer. The background, Photo ID Texts, Colors, Fonts, and Icons can be freely edited and added to a tag. GatePass uses a customizable database, compatible with standard databases. Capturing, importing or scanning of up to 256,000 photos is possible. Signature Capture is also available for adding to tags (optional). It can also be used as a printing station for tags.